In this far-reaching collection Maurice Harmon extends the examination of modern Irish life that he began twenty years ago. the mischievous boy exposes the conditions of life in Ireland through various manifestations - in James Joyce, Thomas Kinsella, and William Carleton. The transformed nature of Irish society is projected in the satirical 'A Vision of Ireland in the Twenty-first Century'In a style of luminous simplicity Maurice Harmon gives us elegies, love poems and humorous asides, delicate evocations of love and loss, considerations of misunderstanding between fathers and sons, a discussion of the attraction between men and women against the stark background of wife-murder, and portrait poems of greedy politicians. Childhood innocence and zest for living are celebrated in the title poem that serves as a foil for the discoveries of pain, deceit, and uncertainty in later experience. In the concluding section, he considers human experience in Egypt, the Middle East, America and Japan. Maurice Harmon, Emeritus Professor of Anglo-Irish Literature at University College Dublin, is a distinguished critic, biographer, editor, literary historian, and poet. He has edited No Author Better Served. The Correspondence between Samuel Beckett and Alan Schneider (1998) and has translated the medieval Irish compendium of stories and poems The Colloquy of the Old Men (2001). He has written studies of several Irish writers, including Seán O'Faoláin, Austin Clarke, and Thomas Kinsella and edited the ground-breaking anthology Irish Poetry After Yeats. His Selected Essays (2006) contains articles on William Carleton, Mary Lavin, John Montague, and contemporary Irish poetry. A study of Thomas Kinsella as poet and translator, Thomas Kinsella. Designing for the Exact Needs, was published in March, 2008. His poetry collections include The Last Regatta (2000) and The Doll with Two Backs and other poems (2004). The title poem of The Mischievous Boy has been set to music by Derek Ball and is the subject of a stained glass window by Phyllis Burke. and laid it on the pool where it drifted to one side. beginning to go along with these translations. to assume a different order risen on water. the silent pang of each fresh separation. beyond slight adjustments, neither here nor there. "Poems with mischief and memory"
Maurice Harmon exudes an empathetic warmth in his third collection The Mischievous Boy. After a distinguished career as an academic, Harmon has dedicated himself to writing poetry. But this is no po-faced scholar turnedpoet. Yes, Harmon is a serious poet, but one who employs a keen sense of mischief, memory and inventiveness. From the hilarious "Dear Editor" where an aspiring poet reminds the editor that her husband "says he marked you when you played top of / the left for Louth // He says you were a 'dirty hoor.' / With best wishes // Yours sincerely, / Jasmine. / P.S. That's the name of a flower," to the laconic and heart-breaking "When Love is Not Enough", Harmon exercises exact control in his prosody, often using lucid blank verse. In "A Wind-swept Spirit", the openingpoem and an ars poetica of sorts, Harmon confesses what writing poetry has meant to him, "To tell the truth ever since it started / I've never known peace, caught between / one doubt and another, one word and the next." "When To the Sessions" is a tour de force in over one hundred lines. Like "The Gentle Years" Harmon displays an ability to combine tenderness and pathos with a fiercely unsentimental honesty. In fact, Harmon's distinctive talent is for the sustained narrative of memory. You see it in poems such as "The Unconstrained", "During the War" and, of course, in the rollicking title poem, which has been set to music by Derek Ball and is the subject of a stained glass window by Phyllis Burke. The Mischievous Boy is a rich and rewarding book. In it Harmon "takes pleasure in sight touch and smell." A poet who will soon be entering his eighties, he has "put an end to cursed tightlippedness". He "wallows in joy." and he does it with style. Paul Perry is currently writer in residence for DÃºn Laoghaire Rathdown public library service. His most recent collection of poetry is The Orchid Keeper. There have been many samples of Irish poets over the years, and each one is more fascinating than the last. 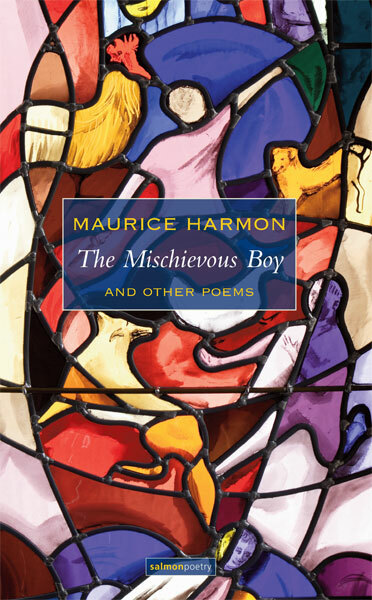 The Mischievous Boy is a focus on Ireland in the twenty first century from Maurice Harmon, a celebrated professor and man of literature from Dublin. His work displays his knowledge of literature and poetry well, making for a fine and exciting adventure in verse. The Mischievous Boy is an excellent addition to any world poetry collection.